AquaPlay™ multi-level interactive structures stimulate the imagination and create exciting hands-on adventures for kids of all ages and skill levels. A variety of interactive features including tipping buckets, waterslides, net climbs and spray elements provide guests endless possibilities to explore. Custom theming creates a truly one-of-a-kind attraction. AquaPlay™ 350 is an innovative attraction, designed to stimulate the imagination and create adventures for everyone, in a compact footprint. Empex Watertoys® has created a new line of interactive water features with a tropical theme. The new features are leafy flora and zany fauna with tropical trees and flowers, caterpillars and butterflies, bugs and snails, monkeys and birds, all intended to provide an exciting and unique water playground for kids up to age 12. 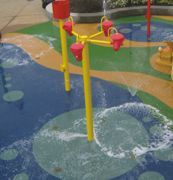 Interactive water play structures with slides are also available to create a dynamic tropical centerpiece. Products provide a lifetime corrosion warranty. For more than two decades, the industry has looked to Mason Water Slides for the safe and affordable alternative to large fiberglass slides. Mason's poly tube slides are the safest because it is virtually impossible to fall off of, or out of, one of these slides. The durability of Mason's waterslides has been proven over the past 20 years. A price quote from Mason always includes design, manufacturing, shipping and installation. No Fault Safety Surface for Water Applications is ideal for splashpads and pool decking. It is comprised of EPDM rubber granules and polyurethane binder and is professionally installed with a single pour system. The result is a highly durable, slip-resistant surface that provides cushion-like comfort and comes in a variety of attractive colors. No Fault's in-house designers can provide a custom design to meet your needs. Available exclusively for the parks and recreation market from the PlayCore Family of Brands, Life Floor slip-resistant tiles offer an ideal solution for wet recreation areas with heavy barefoot traffic. The impact absorption and slip-resistance of the tiles promote safety in aquatic areas: spray decks, splashpads and pools. Available in a variety of custom designs and thicknesses that can mimic natural materials. Built to last, they can be installed over many substrates. Set sail with ARC's new Pirate Ship. This Multi Play structure is an excellent centerpiece for any aquatic area or splashpad. Let kids' imaginations soar as they interact with this pirate-themed structure. It features a Ship Mast, Pirate Flags, Water Cannons, Slides and a Ship's Wheel. Aquatic Recreation Company (ARC) offers many Multi Play structures that combine interactive multi-level water play elements into a single cost-effective structure for kids of any age. Keep your splashpad crypto-free. Neptune-Benson's ETS Ultraviolet Disinfection systems are world-class UV systems used for a number of applications in the aquatics industry and beyond. ETS systems use fewer chemicals while improving water safety, and protect your swimmers. They are validated 99.9 percent effective against crypto. ETS systems are the only UV systems validated to NSF 50 2012 ED and USEPA UVDGM. Water Wars celebrates 25 years of manufacturing water fun attractions that create smiles, laughter and vivid memories. If you're looking to set yourself apart with unique products that entertain the whole family, visit Water Wars at the World Waterpark Show (booth 1005) or the IAAPA show (booth 5106) for the latest in water fun.